When you go to a major sporting event, the average fan might not think of the behind-the-scenes technology that goes into ensuringeveryone has consistent and accessible cell coverage throughout the day. Many stadiums and amphitheaters put significant time and resources to ensuring you can make and receive calls and text messages, tweet about your experience, and use those wireless devices we’ve become so accustomed to having. Making sure the wireless system can handle the capacity of people entering a large stadium is a very difficult undertaking. Construction materials, the placement of antennas, and a variety of other factors all influence how successful a stadiums wireless system can operate. We were recently approached by the University of Notre Dame to help them troubleshoot some key areas to their football stadium’s DAS (distributed antenna system) network. They have a number of antennas throughout the space, and actually operate several separate DAS systems throughout the stadium. One DAS system serves the general “bowl” section of the stadium, a second DAS system serves the patrons as they walk through the stadium’s concourse, and a third DAS system is wired inside box suites. University of Notre Dame occurred when 75,000 people were in the general “bowl” area of the stadium, and another 5,000 people were inside the suites. There were so many people in close proximity to the suite’s antenna’s, that they were able to pick-up the suite’s cell phone signal and disregard the “bowl’s” cell signal. 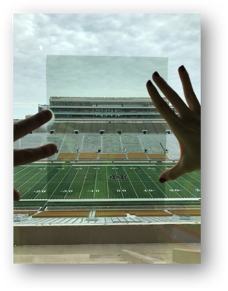 By applying the Signals Defense DAS Shield window film to the glass separating the box suites with the “bowl” area of the stadium, the University of Notre Dame was able to ensure everyone was on the wireless system they were intended to be on. This means each system can operate to the expected data workload each was designed to handle, and everyone can tweet, send and receive texts, and make those important phone calls (what bar is everyone celebrating at after the win!?!?). Next up for Signals Defense? Configuring a way to only allow Notre Dame fans on the stadium network and specifically exclude USC fans… If you have an idea of how to implement such a program, please contact us!